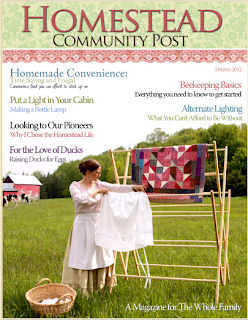 Homestead Revival: Give-Away: Homestead Community Magazine! The Homestead Community Post is celebrating their first Ezine (or Emag) with a give-away! "We are so excited about our Homestead Community Post magazine that we wanted to share our joy with others by doing a big give-away." Ten winners will be selected for some great prizes along with 10 free Volume 4 (a new early release) of the Homesteading for Beginners DVDs. • 1st Prize: Pioneer Clothes Drying Rack ($99 value) + Homesteading for Beginners DVD Vol. 4 ($39.95 value) for a total prize of $138.95! • 2nd Prize: Complete Homesteading for Beginners DVD Set (4 volumes) for a total prize of $99.80! • 3rd Prize: Peddler Clothes Drying Rack ($49 value) + Homesteading for Beginners DVD Vol. 4 ($39.95 value) for a total prize of $88.95! • 4th Prize: Homestead Size Washboard ($39 value) + Homesteading for Beginners DVD Vol. 4 ($39.95 value) for a total prize of $78.95! • 5th Prize: Pioneer Size Washboard ($24.95 value) + Homesteading for Beginners DVD Vol. 4 ($39.95 value) for a total prize of $64.90! • 6th Prize: Self-Sufficient Book ($24.95 value) + Homesteading for Beginners DVD Vol. 4 ($39.95 value) for a total prize of $64.90! • 7th Prize: Homesteading Book ($24.95 value) + Homesteading for Beginners DVD Vol. 4 ($39.95 value) for a total prize of $64.90! • 8th Prize: Simple Living Book ($24.95 value) + Homesteading for Beginners DVD Vol. 4 ($39.95 value) for a total prize of $64.90! • 9th Prize: Back to Basics Book ($24.95 value) + Homesteading for Beginners DVD Vol. 4 ($39.95 value) for a total prize of $64.90! • 10th Prize: Homestead Cook Book ($24.95 value) + Homesteading for Beginners DVD Vol. 4 ($39.95 value) for a total prize of $64.90! • Share Homestead Community Post Magazine on Facebook with a link for both the photo and pdf download. One person can increase their chances of winning the more they spread the good news - Homestead Community Post's Premiere issue is FREE! To record your entries, please visit HOMESTEAD DRYING RACKS! Comments left here will not count toward the drawing. Best wishes on the give-away!